Welcome to Ireland’s Pit Bull Terrier Association, home page for the Working Pit Bull Terrier community. 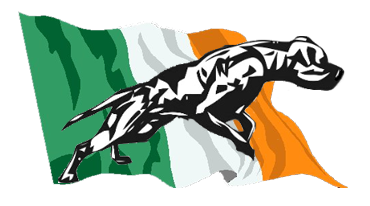 We are dedicated to the American Pit Bull Terrier and to open the eyes of the people of Ireland to the true working abilities and qualities of this amazing breed. A prime example of the APBT pictured above shown true working abilities and determination: Athletic K9 CH, HANK OF YENALED, owner Jules Delaney..
A little about us, IPBTA was founded in 2007 and is run by a group of responsible dog owners. We are a NON-PROFIT organization working on a voluntary basis. We are dedicated to our work and believe that community outreach and breed awareness has been far from adaquate. At our days out its all about creating a fun atmosphere for both owner and dog while sharing each others commen interests, knowledge and experiences. There is always a crew member on standby to help if you need information on Health, Diet, Basic obedience and handling skills. There are some very basic things you can do to develop your dog into a good puller. The first thing as with all training is understanding your dog, what drives it and understanding how to enhance that drive in a professional controlled manner. Your dog will love this! Lure racing is fantastic fun for all involved, its also a great way to keep your dog fit and healthy. 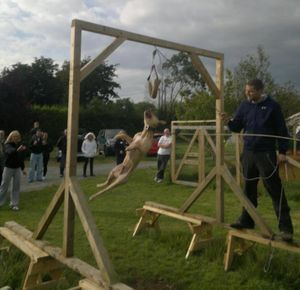 A very exciting discipline where the dog is timed pulling half their own body weight 50 meters. Daisy Owned by Charisma Ferguson. This is a very exciting activity, A lure is placed under each hurdle and off they go having fantast fun. 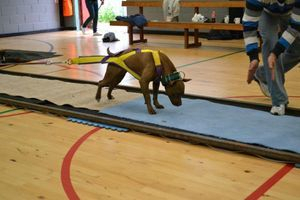 Hurdles can be used in a verity of different ways, you can have dogs run alone or you can compete in a hurdle knockout game against a number of dogs. Pictured above Molly & Lily, competing in a hurdle knockout game in 2010. Another fun activity giving your dog a fantastic workout! APBT pictured here clearing 9 feet in this picture. King is owner, Jason Swords. All are welcome to simply come along and have a fun day out with the family and get involved in training days provided throughout the spring and summer months. Please note, we welcome all dogs with or without pedigrees to participate and compete in athletic sports. IPBTA days are designed to promote responsible ownership and the positive image of the Bull & Terrier breed. The benefits of our days are endless, from tips on handling skills, importance of socializing, diet, condition and behavior.